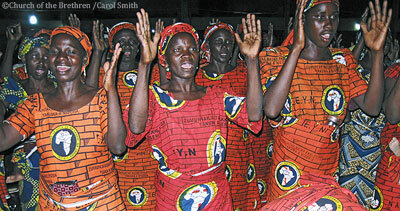 Our Sisters and Brothers of the Ekklesiyar Yan’uwa a Nigeria (EYN, the Church of the Brethren in Nigeria) are facing trials to their faith far more severe than anything we in the United States church could even begin to imagine. Amid such violence, hatred, and hardship, the EYN has remained resolute in it’s commitment to active nonviolence and enemy-love. Don’t underestimate the power of praying about the situation, reflecting on Nigeria in your bible study, pursuing more information, or discussing with or informing your friends and others about what is happening. By the same token, if something bigger fuels your imagination, do it! Being a Dunker Punk means following Jesus and reflecting his love to everyone you meet, through every circumstance you face. Here are just a few ways that you can get involved. The idea is that when we strip something from our lives, we make more room in ourselves for Jesus to inspire and move us. In this case, we also open ourselves up to bear some of the suffering of our family in Nigeria. This may mean giving up an episode of TV every day to instead write a letter to your Congressman about the situation in Nigeria. Or it may mean giving up the $3/day you spend on Starbucks to contribute to the EYN financially. Or perhaps you could divert he energy you spend playing video games into vigorous prayer and Bible Study. Use your imagination! Let Jesus guide your feet. One place to start is a resolution passed by this year’s Annual Conference in support of the EYN. The resolution gives an overview of the situation, and provides links at the bottom for more detailed information. Another resource to consider is this letter sent from the Pastors for Peace of the Shenandoah District to the churches within that district. Continue to do research! The more you learn about the suffering of the EYN, the more you will feel the need to get involved. The more you learn about the courageous witness of the EYN, the more you will want to reflect on your own faith. There are already plenty of people in the Church of the Brethren and beyond who have felt the call to do something about what’s happening in Nigeria. When you encounter these people, listen to what they have to say. Learn about how they have felt led to respond. Maybe you’ll get some ideas yourself. One project started by some of your fellow Dunker Punks is the Muna Daya Movement. Check it out. Muna Daya is a movement to return the violence and hatred of the leader of Boko Haram with even greater love. Listen to the EYN itself. The EYN specifically asked for us to fast for them. How better then can we show our support than by granting their request with sincere enthusiasm? And while you’re at it, and this is something I can’t say enough, be inspired by their amazing witness of Christ. Imagine for a second if you risked death every time you expressed your faith. Could you do it? That is a real struggle faced by the EYN, and they’ve constantly demonstrated how faithful they are. Most important of all, listen to Jesus by studying and praying. I know that you all feel something when you think of Nigeria. How many of you have seen a video or heard a presentation and teared up, just at the thought of such faithful and devoted servants of Christ facing so much suffering. Jesus is speaking to you about this. And the more you study and prayer, the clearer it will become how you can act as Dunker Punks in simple but profoundly impactful ways. The best thing you can do for Nigeria is to follow Jesus with confidence. If you have an idea, stand up and speak your mind. Recruit your friends, church family, and fellow Dunker Punks to help you! Let us know at dunkerpunks.com, and we’ll do whatever we can to help you speak even louder. This website, this whole movement, is comprised of your voice! So seize that opportunity. Tell others what you know about Nigeria. Tell the Dunker Punk community how you feel, what you are doing, what we can pray for, and how else we can help. When you are listening to others, speak up and ask how you can help. Offer your support! Offer your prayers! Do something! Speak to Jesus. Speak to one another. Speak to your elected officials! Speak to me. Speak to your parents, to your church. Speak up! Thank you for your comments! I’ve been looking for some with passion to guide us in our efforts. We feel so helpless about these girls, as though there is nothing we can do. I heard Rebecca Dahli tell about the girls at Annual Conference, and she was very moving. Her husband is one of the main ministers in the church over there. We need to read everything we can about the missing girls and put pressure on our legislators and Pres. Obama to join the search for them.